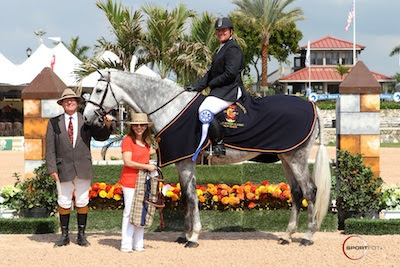 Glen Senk and Another Place are the winners of the Peggy Cone Memorial WCHR Adult Hunter Classic during the sixth week of the 2011 FTI Winter Equestrian Festival. Wellington, FL - February 20, 2011 - Glen Senk did more than steal the show this morning as fifty-three entries came out for a chance to win the title in the Peggy Cone Memorial WCHR Adult Hunter Classic. Senk had a total of four entries in the class, all of which placed in the top twelve. Senk's newest mount, Another Place, took top honors in the class with an average score of 83.5 in the first round, and 85.5 in the second round. Senk, and his own Fashion Farm, recently purchased Another Place, an eight-year-old Holsteiner gelding by Carano, through his trainer Scott Stewart. This week marks only the fifth time that Another Place has shown in competition. "He's the sweetest, gentlest, kindest animal," beamed Senk about his new horse. Senk went on to place third on his own mount Declaration, a nine-year-old Westphalian gelding by Collin-L. He was awarded sixth on another of his mounts, Blessed. Blessed is a seven-year-old Holsteiner mare by Limotas. Senk's fourth ride, Highland Park, also owned by Senk's Fashion Farm, was awarded the eleventh place award. 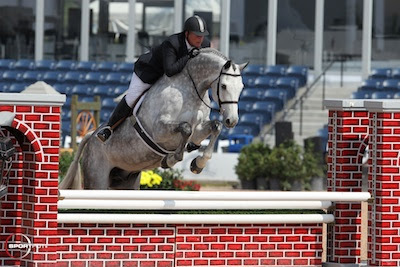 Highland Park is a twelve-year-old Dutch Warmblood gelding by Welt Hit II. There were no complaints this morning as exhibitors learned that their class had been moved into the International Arena. When asked about the change and the course, winner Glen Senk said, " The course was beautiful, and I don't know whose decision it was to move it out there, but thank you. It's so nice to ride out there, and the horses love it." Due to the two round format of the class today, Senk was definitely the busiest of the twelve riders that were called back to compete in the second round. When asked about his feelings before entering the ring on all four of his entries in the second round, Senk said, "All I focus on is having fun. 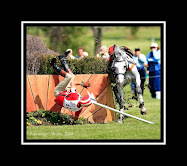 I have the best horses, and I just try to give them a nice ride." Carol Cone holds the Peggy Cone Memorial WCHR Adult Hunter Classic in honor of her sister, the late Peggy Cone. The talented Peggy Cone not only showcased her talent in the show ring, but also through her amazing voice. Cone's album was played in the background throughout the running of the hunter classic. "We've always wanted it in the International ring," explained Cone. "To have it in that ring, and to let everybody flow was really a thrill." Other awards presented today were the week's high scores. Victoria Colvin and Olivia Esse were each presented with awards for their high scores during the week's competition in the junior divisions and Esse also earned the Leading Lady Rider award for her high score in the first round of today's competition. Katie Robinson earned the high score in the Amateur-Owner Hunters, and Scott Stewart and John French received the high scores in the professional divisions. Meredith Darst and Tobasco earned the award for Grand Champion Junior Hunter. 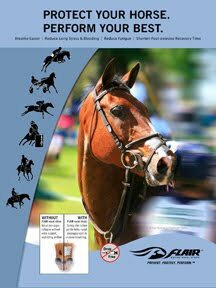 The USHJA would like to thank its generous sponsors for the 2011 WCHR Hunter Classic Spectacular, including: Ogilvy-The Official Therapeutic Saddle Pad of the USHJA, who will be supplying therapeutic saddle pads to the top six riders in both the Professional and Junior/Amateur-Owner Hunter Spectaculars; Essex Classics, who will be providing riding shirts to the high score Professional and Emerging Professional riders and to the high score Junior and Amateur riders on Sunday morning; and Arc De Triomphe (ADT), the Official Saddlery of the WCHR, who will be supplying bridles and bridle bags to the winners of each WHCR Classic. The 2011 FTI Winter Equestrian Festival will continue with its seventh week of competition on Wednesday, February 23, 2011, again sponsored by Fidelity Investments®. The week will feature the $31,000 WEF Challenge Cup Round 7 on Thursday afternoon, the $15,000 Artisan Farms Young Riders Grand Prix on Friday evening, the $75,000 Fidelity Investments® FEI CSI 2* Grand Prix on Saturday evening, and the $25,000 Suncast 1.50m Championship Jumper Classic on Sunday afternoon.